Whether you share my passion for romance set in Regency England or are just curious, I hope you enjoy your visit. Download my free sampler, or click on the links above to learn more about me and my books. Happy reading! To find out about new releases and special deals, please subscribe to my mailing list. 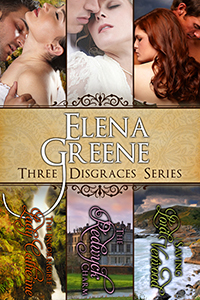 Get one to three chapters of each of Elena Greene’s award-winning Regency romances, seven stories ranging from sweet traditional Regencies to longer and more sensual historical romances. 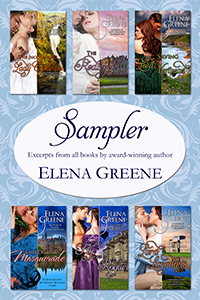 Please note this is a FREE SAMPLER, not a complete book! A village schoolmistress’s life takes a turn when a Waterloo veteran turned balloonist crashes nearby and is brought to her cottage. 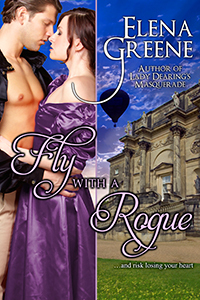 Passion sweeps them along, taking them on a scandalous flight across the English countryside. They must marry, but can they make a life together? A rebel, an heiress, and a wallflower find love where they least expect it… This bargain-priced three-in-one ebook set includes the following reissued, full length Regency romances: The Incorrigible Lady Catherine, The Redwyck Charm and Saving Lord Verwood. Elena Greene is a a participant in the Amazon Services LLC Associates Program, an affiliate advertising program designed to provide a means for sites to earn advertising fees by advertising and linking to amazon.com. Copyright © 2015, Elena Greene. All rights reserved.